Leeba is a speech therapist who has experienced postpartum depression twice. Originally from Baltimore, today she lives in Lakewood with her husband and children. This is her account of her second encounter with the postpartum monster. The postpartum depression happened again, two kids later. This time I recognized it right away, and I ended up taking medication. When I found out I was expecting again, I was so excited and felt totally ready to handle it, and I believed that the PPD thing was totally in the past. Especially because I thought I’d learned the tools, so if it happens, I’ll just talk to myself again! I’ll be over it! Six weeks after the baby was born, I began feeling it again. The thoughts take on a life of their own and you can’t differentiate between them and your imagination. After a few weeks of feeling this way, I tried using cognitive tools to overcome the thoughts, but it wasn’t enough. They didn’t go away. In my head I was thinking, “My cousin doesn’t know what she’s talking about ….” I’d always thought she was a nebach case, pitiful because she had to take medication. But over the next few days I kept trying the self-talk stuff in my head, and it was totally not working. I couldn’t function. The thought of carpool literally put me into a panic. I knew that wasn’t normal. I was immobilized, walking around in a daze. And I’d wake up at night with thoughts that made me so insecure even though they were crazy. They were irrational thoughts, like, “I’m going to go off the derech,” [leave being religious] or “I’m going to hurt my kid.” It was always the things I felt so close to — the stable, solid things in my life: my religion, my husband, and my family. My crazy thoughts would be about how all those things were going to be taken away from me. For me, it was much more the anxiety causing depression, not the depression causing anxiety. I remember thinking it’s such an olam hasheker [world of lies] because no one knows what’s going on. Of course, when I got there I was, like, hi, good morning, whatever. But it took all my will power. They think I’m the perfect mother having her fourth kid, and I have a nice husband and B”H don’t have to worry about money so much, and everything’s great for me, and my kids always look cute. On the outside I looked normal, but on the inside I was falling apart literally. I was so scared of it but I took the next step and went to my OB/GYN. Emotional pain is so hard, because your normal defense mechanisms for any type of pain or tzaar [suffering] in your life are your intellectual or spiritual capacities. But here, those were the things that were actually affected! Also, it’s so difficult because everything on the surface is fine. There’s no event and you can’t pinpoint a certain physical organ. You feel like you’re making it up. I felt like my spiritual side was damaged. I couldn’t even connect with Hashem. I felt like I couldn’t daven. I was like an emotional rock. And the worst thing is that you can never talk to anyone about it, because they’ll think you’re crazy, or they won’t understand. I went back to my rabbi. I was at the worst, worst. I was talking the real truth to the rabbi, unlike what I did the first time. I’m having these crazy thoughts, and I don’t know what to do. Why is Hashem doing this to me? This was totally l’sheim Shamayim [for a higher purpose]. So I went to another doctor, who told me to stay on what I started and wait till it kicked in. And she also gave me sleeping medicine, and that totally helped, because I hadn’t slept in like a month. She kept telling me I’m going to feel better. And that’s what happened. All of a sudden I woke up one day, and it worked. For six weeks it was like a horrible nightmare, and now I woke up. I think I did the biggest act of gevurah [heroism] by taking the medication. It was so hard for me because I was so scared. I completely believe in all the eating-healthy and self-talk stuff. But the medicine can help you get to that level to be able to do that stuff. I didn’t know how to reconcile the whole hishtadlus [personal effort] thing with the medicine. I realize now that Miriam Adahan’s approach really works — getting your emotional equilibrium. However, if for physical or mental reasons you need medicine to help you not be so out of whack so you can be at the level to work on all that stuff, then you take medication. I suffered so much longer the previous time I had PPD, because I was refusing to ever do anything about it. And this time, it was horrible, intense, and terrible, but it was a short time and it’s over now. I did something about it. I don’t feel bad about it. I feel like I did the smartest thing. But in the frum [Orthodox] world it can feel like you’re putting yourself in the camp of the crazies if you do such thing because there is such a huge stigma. I wish I could’ve had someone else tell me they went through this, and they were fine. I would at least have felt relieved. But of course, you can’t talk about these things, so you’re totally in it alone. Now I’m mature enough to realize that people suffer so much because they’re afraid of the stigma. My doctor told me a million times that it was totally hormonal and had to do with the changes in my body. But I had in my head that I had to end up in a psychiatrist’s office, talking about my feelings. Totally untrue. Reproduced with permission from Mothers to Mothers, by Julie Hauser; copyright ArtScroll/Mesorah Publications. Vote for the new JewishMOM.com Slogan! Can you imagine what a Postpartum Doula would have done to help this woman and her family? Oh my… Birth doulas get you through birth. Pospartum Doulas get families through the postpartum period. They cannot stop PPD from happening, but can help through this time..
We must begin to utilize the tools at hand. Women are specially trained and certified to work with families after a baby is born… It’s not weakness! I hear stories daily about situations like this. I wrote a practical guide to the fourth trimester, Michal Finkelstein wrote a book dealing only with PPD. There are people who are willing and able to help. there is a wonderful frum herbalist of chinese healing in Givat Shaul, and other chinese herbal healers, this can really help the imbalances. I (author of book) just want to clarify that this book, Mothers to Mothers, is not about PPD, nor a “one woman account” of motherhood. 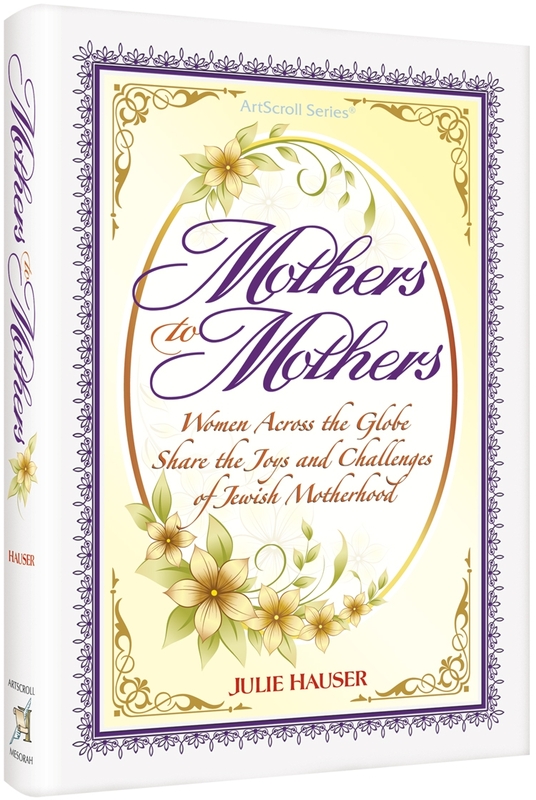 it is based on interviews of over 30 women about the deeper and less-often-shared emotional parts of the experience of being a real Jewish mother (and, the whole book is categorized by topic, not by interview). Since a whopping 4 out of all the women who were interviewed told me that they had struggled with serious PPD, I felt obligated to include an appendix devoted to their personal accounts. The excerpt quoted above is a mere fraction of this woman’s account and it is most interesting because she compares and contrasts her two bouts of PPD and the approaches she took to combatting it and treating it, which were different, partly due to her level of honesty with herself, her Rav, and her doctor. Please advise me as to how I can e-mail you a longer letter or response to both this article and the article about hypothyroidism. First of all thank you for addressing the problem. I also want to tell you about some research I’m doing into hormone imbalance and how these women and so much more who are really fatigued and have a whole lot of seemingly unrelated sypmtoms which drive us down is really a result of a hormonal imbalance THAT MAY NOT NEED DRUGS TO BE SUCCESSFULLY TREATED. Look into bio-identical hormone treatment even if you are on medication it will change your life. Every women has the right to be energetic and happy and healthy and most of us can achieve this by balancing our hormones!